U-Computer is a system that enables the Utelogy platform to integrate a PC into your AV system and treat it like any other device, including monitoring and controlling the PC. Here are some examples of capabilities enabled by U-Computer. Soft conferencing and dialing with the PC. Launching and closing applications on the PC. Controlling the PC’s volume and camera. With Utelogy’s U-Computer, you can turn a PC or an Intel NUC into an AV appliance. Simply by configuring a series of macros, you can design a number of different actions within the PC behind a single button push. In an enterprise, it’s not uncommon to find users need 3 or 4 soft codecs like Skype, BlueJeans, or Polycom for video and/or audio conferencing in these huddle rooms. Unfortunately, users frequently have problems connecting the microphones and cameras to the desired application because not all soft codecs will automatically release a camera or microphone when a call is finished. U-Computer solves that problem because it automates use of the USB peripheral resources and can make them available behind a single button push. Additionally, because that PC has been turned into an AV appliance, tech support can now monitor the equipment in that room. They can be alerted if there is a technical issue and they will be able to collect information about room usage to understand real estate spend and ROI. For tech managers, U-Computer gives both you and your end-users self-sufficiency and an enhanced user-experience and room and equipment usage data. For integrators, U-Computer gives you new revenue opportunities because you’ll have the information to help your customers make the best technology decisions. This sets you up for solid long-term client relationships where you can deliver new business value. 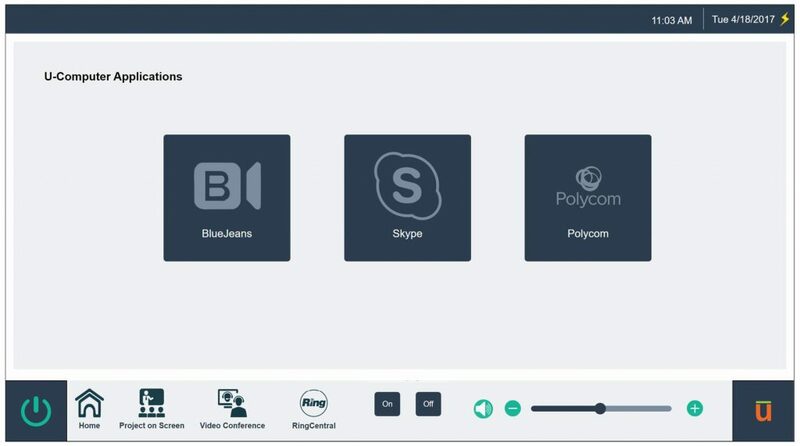 U-Computer use case where users can establish a video call with BlueJeans, Skype, or Polycom.